While the amp hours are expensive — the tested 210 model retails for $5,899, and the company’s methanol fuel costs roughly $10 per 100ah — I’m convinced that an EFOY Comfort could be a very pleasing addition to many cruising sailboats and trawlers, especially as a complement to solar power. The installation, operation and EFOY economics are detailed further below, but first I’ll share a graphical use story. 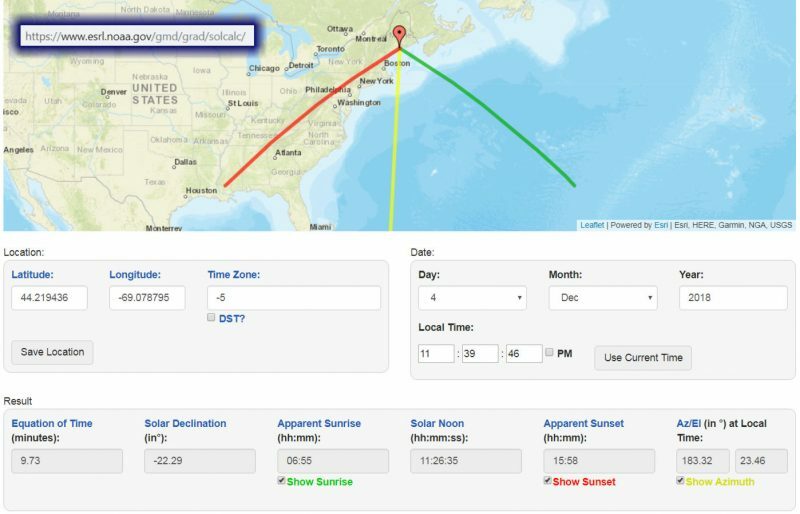 The graph’s simple plot goes like this: During an overcast and foggy summer week, the beloved but neglected cruising powerboat Gizmo lays on her moored float in Maine, her solar panels not quite able to keep up with the loads imposed on her 440 amp hour battery bank by refrigeration and various electronics like AIS and off boat monitoring. 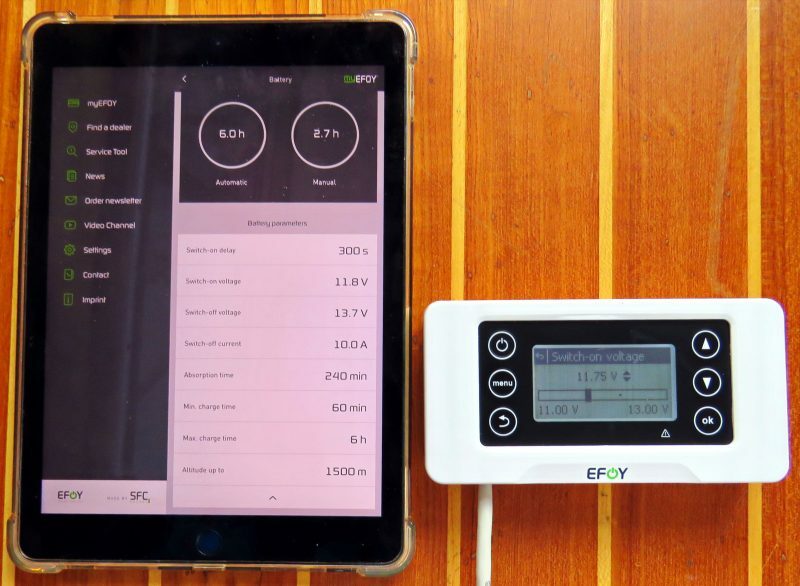 But at about midnight on day two, the alert EFOY Comfort 210 sees the battery voltage sinking to a possibly damaging level and kicks in 8.6 amps for about six hours. Day after day, the dire lack of solar gain continues, but the reliable EFOY valiantly comes to the rescue when needed, until finally the boat’s owner goes for a day trip that more deeply replenishes the battery bank. It’s a sweet story, I think, though maybe the graph should also include the cold beverages enjoyed onboard several times during that week to better illustrate how pleasant it was not to run the main engine just to make some electricity (microwaving a hot lunch on a dank day excepted). 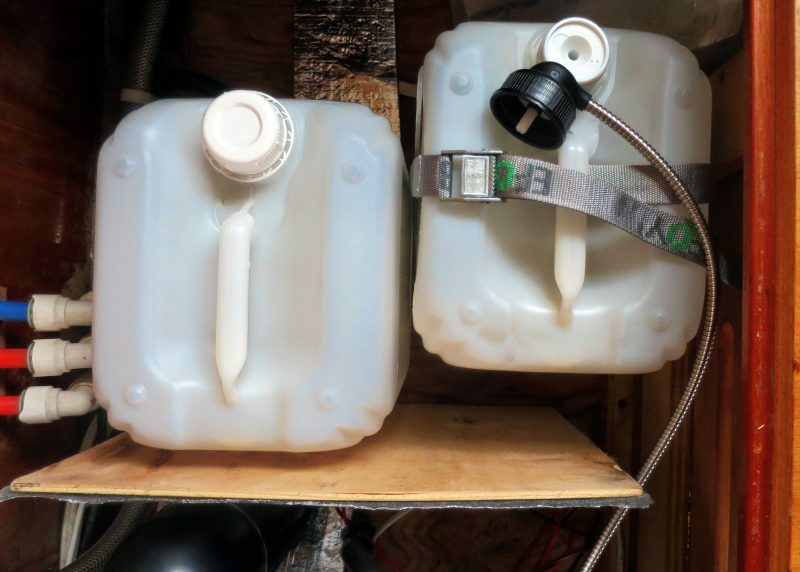 Plus, given that the EFOY 210 can run over 100 hours on a full 2.6 gallon fuel cell, I could have left the boat unattended for many more days and still have had running bilge pumps and cold beer when I got back (and I also would have been alerted by one of the monitoring systems if the power or bilge situation had changed). And there are very different EFOY boating scenarios that might voltage graph in similar ways. Picture, for instance, sailors on a long passage in a decent breeze, but with power needs or desires beyond whatever their solar, wind or hydro sources could generate… or any kind of cruising boater snugged up in a very quiet cove. These are situations when the near silence of fuel cell generation has great value. Automatic and quiet charging from a lightweight and reliable source produce what I’ve come to think of as premium amp hours. EFOY methanol-fueled chargers are not new — an earlier model line caused quite a Panbo fuel cell conversation in 2009 — but that seems a good thing for an unusual technology that most of us have still never even seen in action. The current EFOY Comfort line has been out in the field for many years, though predominantly in European camper vans, and in 2017 it earned U.S. wholesale distribution and support by the excellent team at Gemeco Marine Accessories. EFOY works and so the question becomes how valuable premium amps are to your boating situation. I’m hoping that the following details will help you decide, but will also happily add that a second round of testing will soon commence. Installing an EFOY Comfort could vary a lot from boat to boat, but it’s hard to picture a situation that would be terribly difficult or beyond the skills of a careful do-it-yourselfer (if you want to go that route). 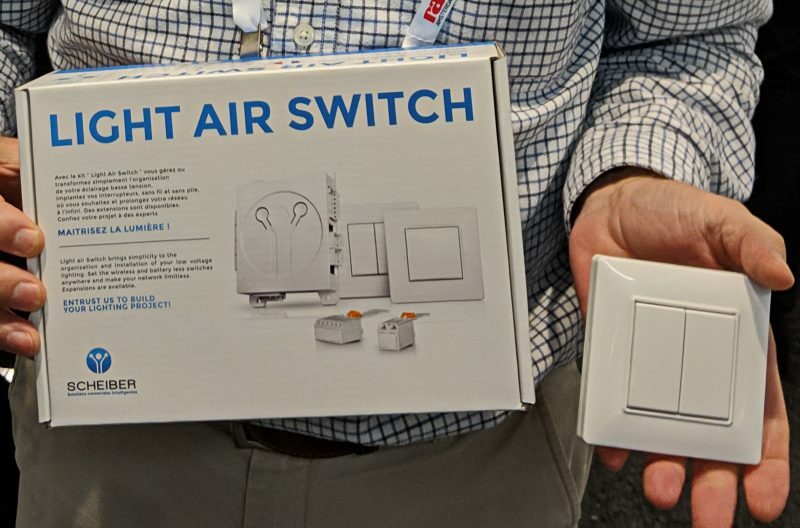 All three Comfort models are about 17.5-inches long, 8 wide, and 11.5 tall — “the size of our breadmaker!” a cruiser told me — and the 210 on Gizmo fit easily in an under-settee locker once fully occupied by an AC unit. The space already had the fresh air supply called for in the install manual, so the biggest task for me was hole sawing the main cabin floor to run the 4-inch exhaust hose out of the living space and into the separately ventilated engine room. The thin “moisture-saturated waste gas” hose — seen above with its gray insulating sleeve — also goes to the engine room along with two wire pairs, one for voltage sensing, the other for charging. You can also see two Cat5 cables, one of which connects and powers the included control panel, the other running to an optional Bluetooth module that can integrate the fuel cell with myEFOY apps. 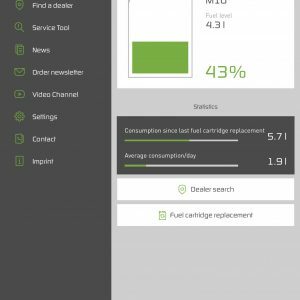 I’ll explain further below why the app is easily worth the slight extra expense and will also detail that fuel canister. Incidentally, even with this EFOY in my main cabin, and much larger locker vents than show in the photo, I can not hear it running unless the silence is total, and then just faintly. In Gizmo’s engine room below that locker (left above), you’d see the working ends of the exhaust and waste lines, and if you were there when it was running you might detect a slightly bitter odor. Methanol is also known as wood alcohol, so no surprise that the smell is like the alcohol boat stoves you may remember. I have seen a bit of dripping from the waste line, which is why it should be directed to somewhere like the bilges. In exceptional cases, the waste gases emitted by the device may contain substances that are harmful to health! Do not inhale waste gases directly for prolonged periods. Instead, use the exhaust tube provided to route the waste gas into the open air. The EFOY 210 came with a fused wiring harness, but I shortened it to minimize voltage loss and used the Blue Sea ST Blade Battery Terminals attached to the bus bars of Gizmo’s Firefly carbon foam AGM battery bank (which is why I’m willing to allow this bank to run down to lower standing voltage levels than normally recommended). I’ve read online posts about using bulk methanol to beat the relatively high cost of EFOY’s own fuel canisters, but usually not mentioned is the latter’s special design. In this photo I’m switching from an empty 10 liter (2.6 gallon) M10 canister to a full one and you can see the jug’s inner cap, which in fact keeps it sealed throughout the process. I never detected even a whiff of methanol while handling these canisters and that’s good because the gas is flammable while the liquid rapidly absorbs water vapor if given the chance, and reliable fuel cell operation is predicated on highly pure methanol. But no one will enjoy paying $140 for a standard two-pack of M10 canisters plus about $56 ground shipping (SC to ME) because of a hazardous material fee. Gemeco is hoping to make refueling cheaper and easier by encouraging marinas and electronics dealers to stock EFOY canisters, though right now getting a local company to order their two-packs is probably your best option. Then again, just one M10 is rated for 925 amp hours (11.1 kWh), which was confirmed in my testing, and the resulting 108 hours of 8.6a charging is actually a lot of premium amp hours when used judiciously (see story graph). But at this point some readers may be snorting to themselves something like “…but once installed, solar amps are completely free!” Which is completely true, and I’ll add that the solar system installed on Gizmo in 2012 has required zero maintenance aside from cleaning off bird crap, and may be the best improvement I’ve made to the boat (for the ways I use her). Free and silent solar amp hours are wonderful, but they are certainly not automatic (and some boats simply can’t accommodate the panels well). 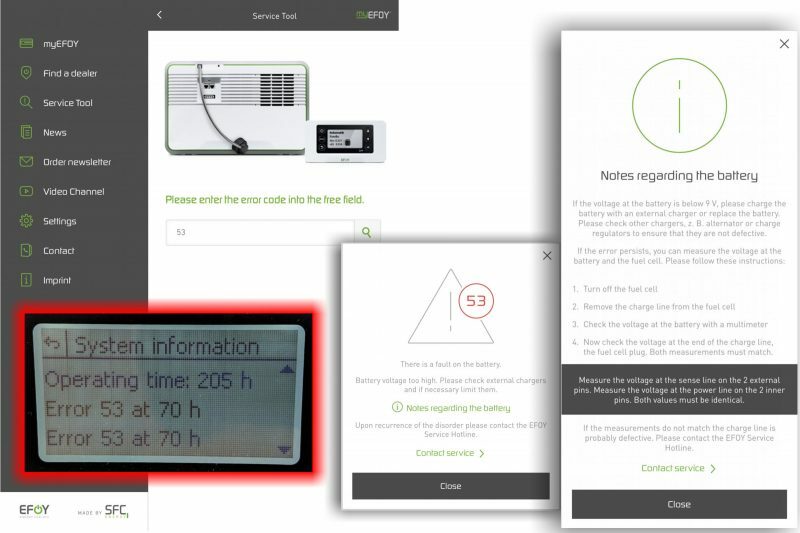 Both the EFOY panel and the app can tell you a lot about the system’s state, but only the panel will let you control the device beyond turning the fuel cell to Automatic, Manual On or Off modes, while only the app will show you the cannister’s remaining fuel percentage (as opposed to the panel’s vaguer fuel icon, seen in the top photo). 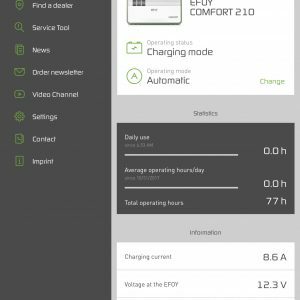 In the side-by-side view above, the app is showing the many parameters that determine when Automatic charge mode goes on and off while the panel’s up/down buttons are being used to set the Switch-on voltage level. It’s not necessary to mess with these settings, but I will explain more about them in the next section. Here are the EFOY app’s main monitoring screens as seen on my iPad Pro 9.7, but there’s an Android myEFOY as well as the iPhone/iPad version. Whatever screen you use, the app is more informative and easier to understand than the little panel, and note that apps include lots of product support, even quick access to EFOY video tutorials. The apps are also useful if your EFOY ever generates an error code. You’re apt to see it on the panel first, but the app’s Service Tool lets you look up its meaning. Incidentally, I don’t know what caused the two high voltage alerts at hour 70, but they’re the last error messages I saw in what was eventually well over 200 hours of use. They were also the only error messages generated during my testing, though Gemeco had caused a couple of Error 11’s — “There is a problem with the air supply to the fuel cell” — while using the same Comfort 210 unit for demos before shipping it to Maine. I find it a comfort that the EFOY self-monitors many aspects of its operations and can shut itself down if it feels the need. 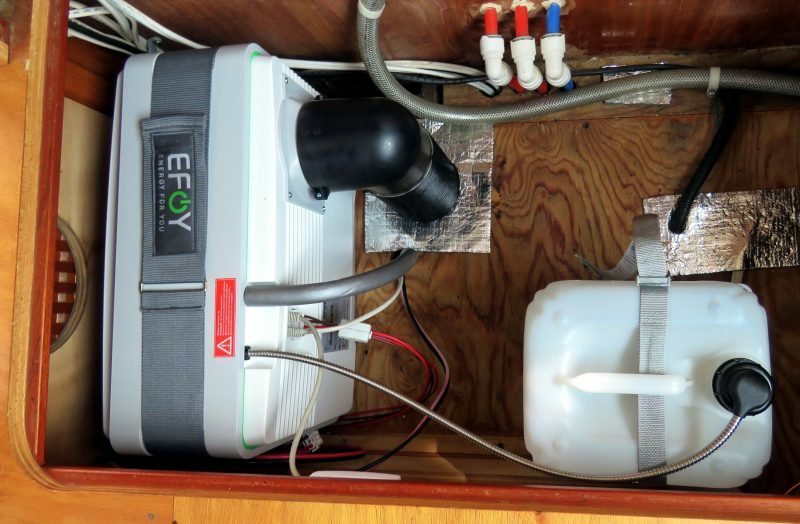 The EFOY literature envisions a fuel cell completely ready to run once it’s professionally installed, and that’s probably the right way for many boaters to go. But the manual also nicely explains the Menu/Ok button combo that open the Expert menu of setup parameters and explains what they do (usefully included in the app too). 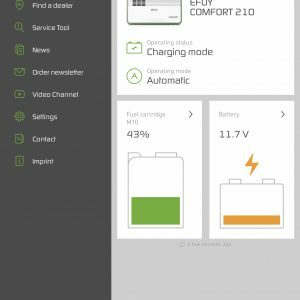 So I was able to fiddle extensively with Battery parameters — like switch-on/off voltages, switch-on delay, and min/max charge times — in a successful effort to get the Comfort 210 to play nicely with Gizmo’s particular battery bank and solar charging. In fact, “Charging parameters” would be a better title for the Expert submenu, and they work well. Note too the Battery protection submenu. By default, even an EFOY Comfort in Off mode will charge attached lead acid batteries if their voltage falls below 11.2 for 15 minutes, and stop charging them if they ever reach 12.8v. The default protection settings vary according to battery type, and you can customize them with the Expert menu, even turn the feature off (though I don’t know why anyone would). 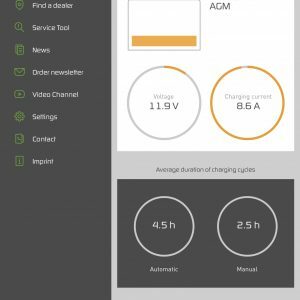 Moreover, EFOY teamed with Mastervolt in 2013 to create what looks like even more intelligent power management, and I view all of this as evidence of product maturity. While the EFOY panel and app will show you a fair amount of fuel cell history, I found off-boat voltage monitoring quite handy for fine tuning and then monitoring enjoyment (onboard too). Seen above are voltage screens from Gizmo’s test FloatHub and Nautic Alert systems, but similar are available from Siren Marine, Boat Command, Maretron and others. EFOY for me or you? So my EFOY testing showed solid performance as advertised and also suggested that premium amp hours can have high value for certain boaters. But one factor so far unaccounted for is the “EFOY 5,000 running hour lifetime” much discussed on this long and influential cruisersforum EFOY thread. 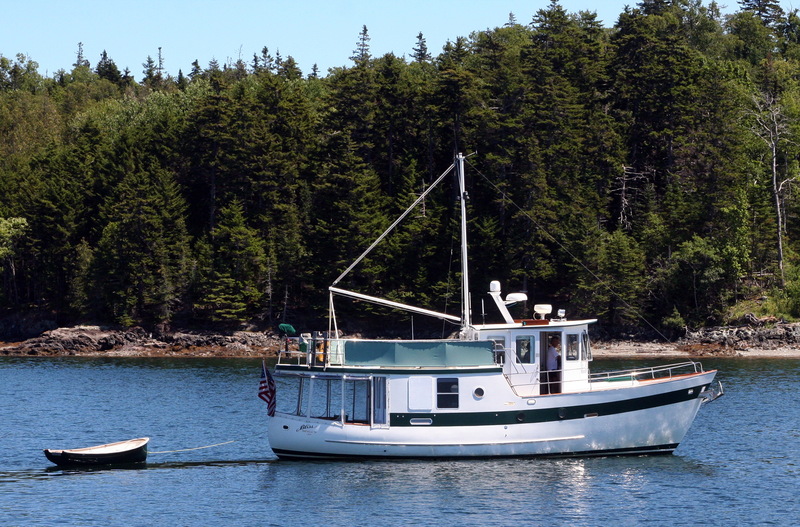 You’ll find a lot of intelligent commentary there and pay particular attention to “Maine Sail,” who is marine power expert Rodd Collins of MarineHowTo (formerly Compass Marine) website fame. Here is some PDF detail on EFOY’s non-EU warranty, but maybe more important is that Gemeco has yet to take one back, and “They just work” is what they heard from several longtime European EFOY distributors before they took on the line. But all that said, I somewhat wistfully decided not to keep the test Efoy (even at a trade discount). It’s largely because after ten years of test installations, I have a strong hankering to strip the poor boat down and start fresh. Plus I’m curious about more ways to reduce battery loads without losing comforts — I’ve yet to try the Fridge Optimizer, for instance — and possible EFOY alternatives like those from Dynad Hydromax or New-Enerday (if they mature). But I didn’t have to ship the EFOY back to Gemeco. When I gave my friend Luis Soltero a what’s-new-on-Gizmo tour in July, the fuel cell lit him up. Team Soltero stopped back in Camden last weekend on their way back from Canada and the Comfort 210 will eventually be installed in an aft cockpit locker on Bliss. 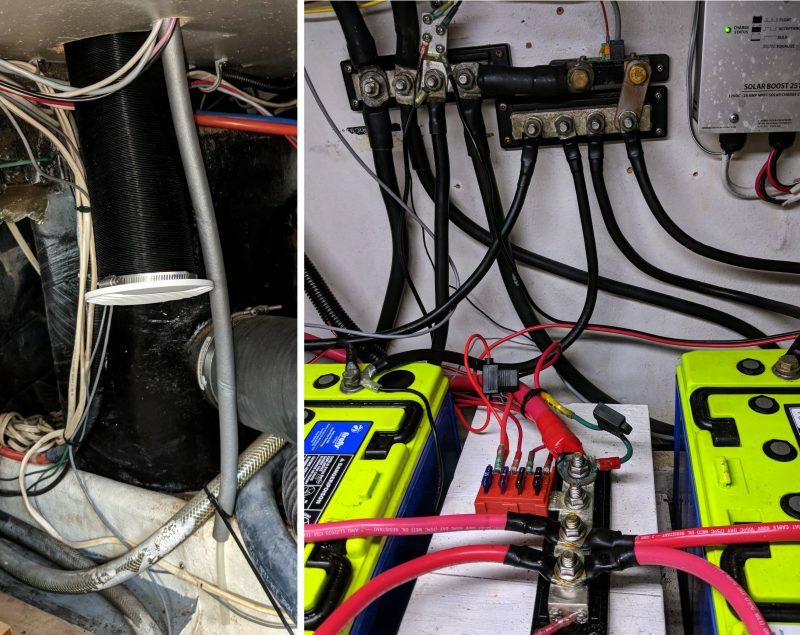 If it works as expected– and the highly analytical Luis did his own homework — the trawler’s rarely-used generator will go to a new home, more solar panels will get added, and EFOY premium amp hours will become a significant aspect of some serious cruising plans. I look forward to hearing about phase 2 testing on Bliss, and also your thoughts and experiences with alternate charging sources. Thanks for the detailed review. I haven’t bothered to look in depth at the EoFY units as no trustworthy reviews were available. I’ve spent time on Methanol race cars (drag and Indy) and have worked with fuel cells in defence so am familiar with the technology. We hardly use our generator now since we added 1kW of solar. If I was considering a generator today then the EoFY would probably make much more sense. I certainly wouldn’t bother with a generator today unless I was planning electric propulsion. Currently we can meet all our living needs with just one of our 350W panels deployed except on very cloudy days. On sunny days with all three 350W panels deployed we can even heat our hot water. We’ve just moved to Southern California from the Pacific North West so solar is a no brainer. We do have provision for two wind generators but I’m going to revisit wind generators or an EoFY unit or update our generator. The attractiveness of solar and wind is the zero cost of fuel and no human input required anywhere in the fuel supply chain. 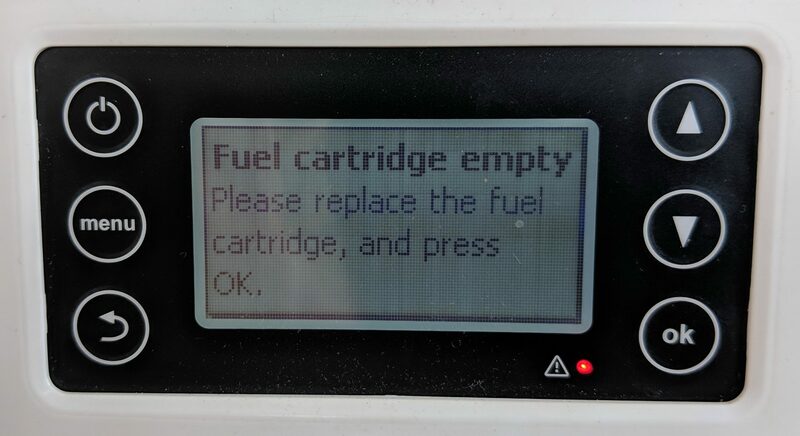 The big negative for the EoFY units today is the proprietary fuel option. That makes no sense for methanol which can be sourced easily. The proprietary fuel is the big annoyance to me. Plenty of boats that don’t have room for solar could benefit. I noticed the Hydromax also uses a proprietary fuel but at least it’s less expensive and cheaper to ship. I have been watching the Watt fuel cell https://www.wattfuelcell.com/ for a while but they still seem a little away from having a consumer product available. Plenty of boats already have Propane on board which might make this a bit more appetizing. It’s listed as compatible with different busbars than yours (which appears to be a 2104), but it will still work nicely. I agree, Grant; if you can fit more batteries, especially ones that you can safely drive down to low SOC, like Fireflies or Lithium, it’s probably a better trade. On the other hand, EFOY makes sense in situations that aren’t obvious. For instance, I know that Gemeco has sold some to high-end center consoles that are rack stored, hence no shore power, but have various 12v loads. And I appreciate your concern about the photo of my exposed and potentially highly loaded busbars. But not shown in the photo is large neoprene insulated panel that fits over all four batteries and the positive busbar. It would still be good to have specific protection over the latter, for when the panel is off, but that hasn’t made it off the to-do list yet. Roger that Ben, I didn’t see the cover. My to-do list is usually a one step forward, two steps back affair as well! I think you’ll like the B/S 2718 when the time comes – I fitted one recently to a similar exposed DC busbar (on a factory installation! )….roll eyes..
Great review. 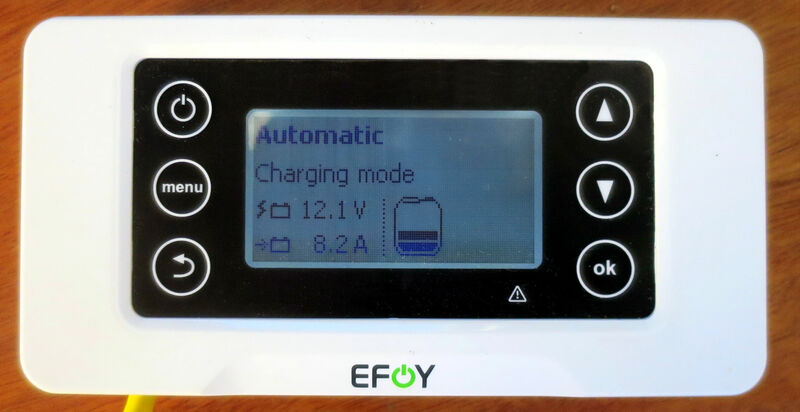 We are toying with the efoy purchase concept and rationalizing the cost with its plug-and-play ease to use it in whichever “home” we’re in:: boat or camper. I agree the proprietary canister is bothersome. Would be nice if West Marine was a distributor! The distribution map in Europe vs USA /Canada/Mexico is envious! And I wish I d known or I would have snatched up your test efoy in a blink! 🙂 thx for your review. While I understand the convenience and safety of EFOY’s own canisters, thin distribution originating in Germany necessarily adds a lot of cost to what is apparently a fairly widely available fuel. But how does an intrepid EFOY owner decant the methanol into empty EFOY canisters without introducing impurities or water? Or how does Gemeco get West Marine to carry the canisters efficiently? There is a lot of Hydrogen vapour ware on the wires these days, most embeding hydrogen in a liquid and using it like gasoline. The generator people Panda have a real product. It costs 20K and runs on Propane. I hope you will have a chance to review it. For sailors the end of ICE engine seems to be around the corner. Thanks, Steve, but I think that press release dates back to early 2015 — https://www.fischerpanda.de/fischerpanda-press-releases.htm — and I still don’t see any propane fuel cell listed as an actual Fischer Panda product. I agree that more alternate power sources are coming to boats. But I’m not sure internal combustion engines will go away as propulsion systems, though maybe as dedicated generators. Have you seen, for instance, how Integrel can efficiently squeeze lots of DC power out of main engines? I was looking at the Efoy site today. They have a 250 watt propane fuel cell, and a 500 watt methanol. The internet says I can buy pure methonal for $1.14 a gallon. I wonder if you could fill up a 100 gal tank? For a blue water cruiser with deep pockets and the patience to wait a day if necessary, it may be the ICE engine is something no longer needed.